After we got back to Luke’s place post-bowling, I worked on the blog post for Tuesday, and didn’t lay down until after 3:10 am. I had my alarm set for 4:15, but woke up a little before that. I gathered my stuff, called the car service, and was on my way to Laguardia by 4:25. It was a 13 minute ride and yet it cost $26. I gave him $30, but I wonder if he just said $26 because he knew I didn’t know any better. My flight took off on time, and we got to Midway by 7:15 am. My flight to Houston was scheduled to depart at nine, and we were airborne at 9:07. We arrived at Houston Hobby Airport earlier than expected, and I was able to jump on an early bus headed downtown. The bus was automatically saying the next upcoming stops along the way, but then failed to do so when I was supposed to get off, and I went down six more blocks than I needed to. It doesn’t seem like much, but when it’s still quite painful to walk, any added distance just makes it worse. 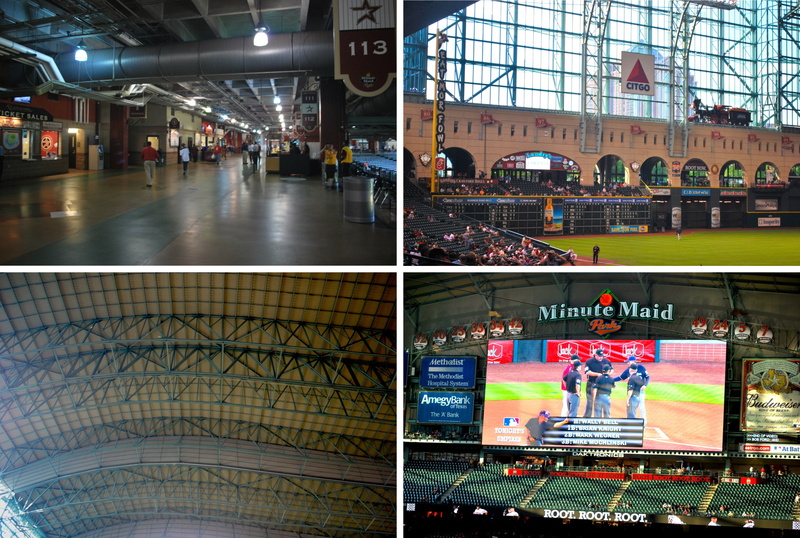 I’m staying at the Holiday Inn on Bell Street, and it’s just a short (6/10 mile) walk to Minute Maid Park. When I got to my room I napped until around 4:30, and then decided to go to Jimmy John’s. I made the walk to the downtown location, only to discover that they close at 4:00 pm. I’m assuming since they’re downtown they really only get business at lunchtime, so it makes sense. What about people that want to grab a sub on their way home from work (or crazed baseball fans who might wander in at random times)? Did you ever take that into consideration, Jimmy? 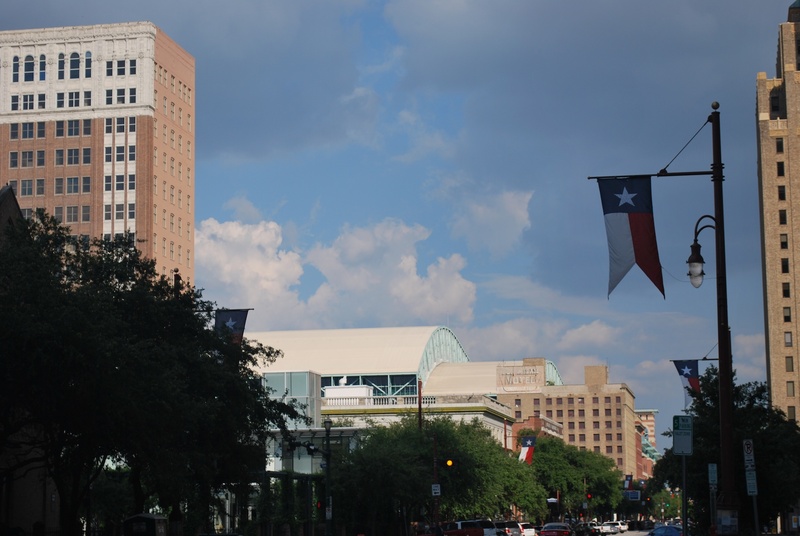 I walked down Texas Avenue on my way to the park, and a few blocks from downtown you can see the roof of Minute Maid Park in the distance. I had to go to the player will call window to pick up my ticket for the game, thanks again Kathy and Tyler for making this happen. On my way to ticket window 30 I came across the baseball barriers. 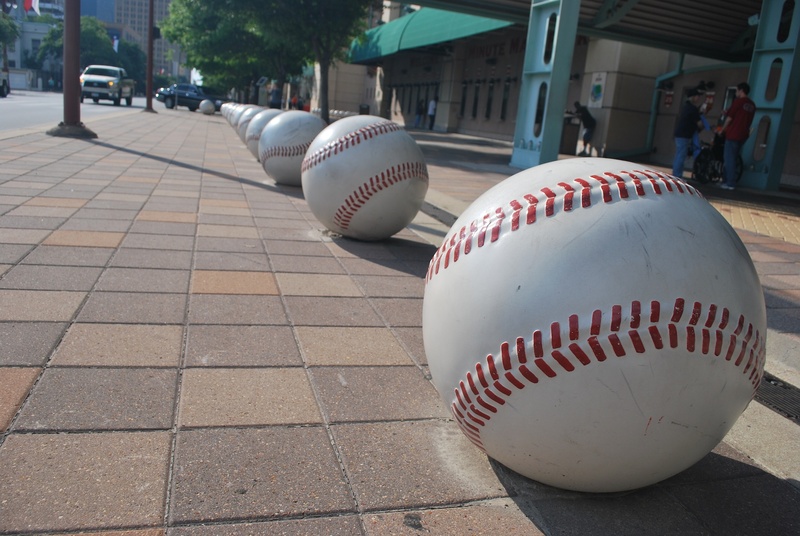 Most all ballparks have some sort of giant baseballs outside the stadium, and Minute Maid is no different. Once I picked up my ticket I walked around to the first base side to get game photo number 37. On the outside of stadium they have a somewhat small Minute Maid Park sign, and I asked a few nearby parking attendants if there was a bigger sign somewhere else. They didn’t think so and I was a little disappointed. I guess I would’ve expected a larger sign above the home plate entrance, but they have a clock tower instead. When asking about the sign, one of the attendants said: “You look like Justin Timberlake.” I thought she was joking but I don’t think she was. I responded with “Thank you, but I disagree.” She repeated it, and it was actually kind of awkward as I walked away. The spot to take the picture was a good 100 yards from the attendants. I didn’t want to ask them to come all the way over to take my picture, so I just used the ten second delay, and propped my camera up on my sunglasses case. It took a few tries but I got one that I’m somewhat satisfied with. While I was wrapping up a gentleman came over and offered to help. 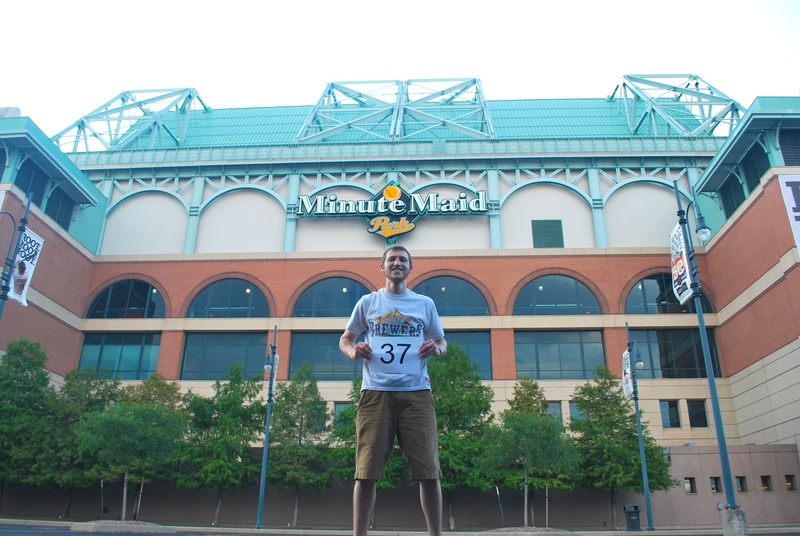 His name was Bob, and Minute Maid Park was the 49th Major League stadium he’s been to. He still has one current stadium to visit, but I forget which. That means that he’s been to 29 current stadiums and 20 former big league parks. I’d say he was in his fifties, and you’d almost have to be to have visited all the stadiums he has. He took a few pictures for me and I returned the favor. I think the self-timer photos turned out better, including the one above, but I’m still grateful for the assistance. 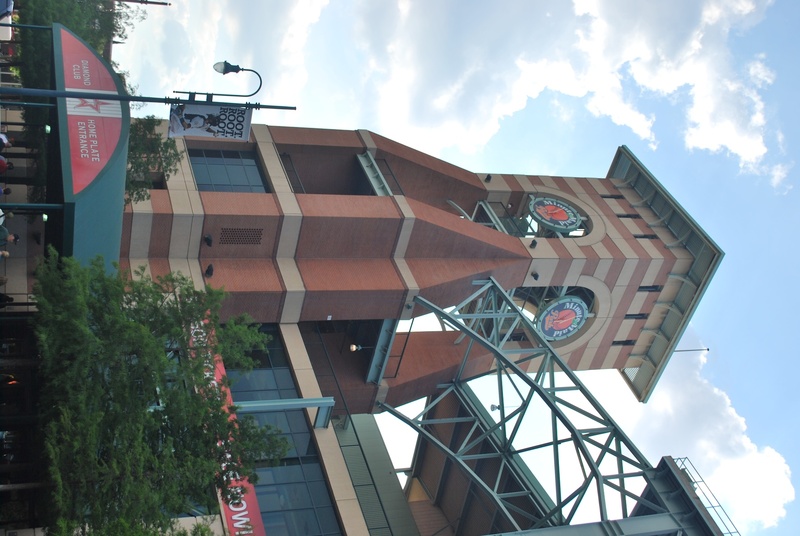 The Astros also have a clock tower, similar to Miller Park’s. I’m not just being a homer, but I think the one at Miller looks a little better. The Astros’ tower is located at the home plate entrance, and not off to the side. I don’t know why they don’t have a more inviting home plate entrance, but to each his own. I entered the stadium at 5:55, and started wandering. One of the first things I came across was a giant boot and a commemorative sign. 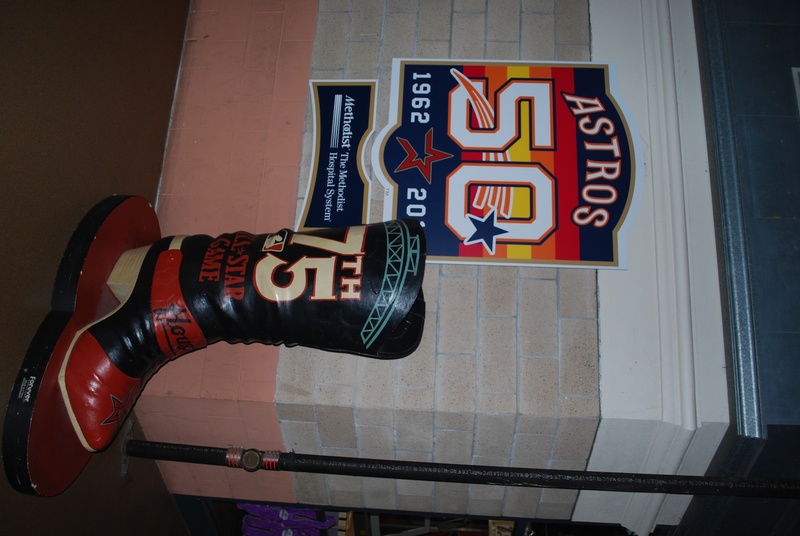 The boots are located throughout the park, commemorating the 2004 All-Star game that the Astros hosted. The Astros franchise has been around since 1962⎯although they were the Colt .45s from 1962-1964⎯thus the 50th anniversary sign. 1) The first level concourse behind section 113. I took a picture because it’s the widest first level concourse that I’ve come across. “Everything’s Bigger in Texas” holds true once again. 2) The Crawford Boxes and outfield wall in left. The Crawford Boxes are the seats to the right of the foul pole, and give batters a short porch to work with (it’s only 315 feet down the line), providing some cheap home runs. It evens out though, as the centerfield fence is 435 feet from home plate. You can also see the train on the right of this picture, I’ll discuss that later. 3) The Astros scoreboard, the second largest HD board in the majors. It’s 54 feet tall and 124 feet wide. It’s nickname is “El Grande”. 4) The retractable roof. I believe they keep it open during the day to get the grass some sunlight, but then close it if it’s going to be hot during the game. I didn’t think it was too hot, and thought they could’ve kept it open. By the time the game was over it was *only* 74 degrees outside, and I don’t think they needed the AC on for the whole game. I’m also cheap and try to not use air conditioning as much as possible, so that might be influencing my opinion. I once let my apartment reach 94 degrees, but I’ve loosened my frugality to some degree over the past few years. They have a wide variety of food choices, but I settled for a personal favorite. One of the stands had Kielbasa, with different toppings choices to appease almost anyone. I went with the Georgia Griller, which consisted of creamy cole slaw, BBQ sauce, and onions. You have the option of a spicy kielbasa or mild, and I (of course) went with spicy. I was somewhat surprised by the $7.50 price tag, as I thought it would’ve cost more. It was worth every penny, and I was set on food for the game. I utilized their designated driver program, and also got a free lemonade. When you sign up you get a paper wristband saying “designated driver program” and two vouchers for free sodas. I only used the one, but I think it’s nice of them to offer two. 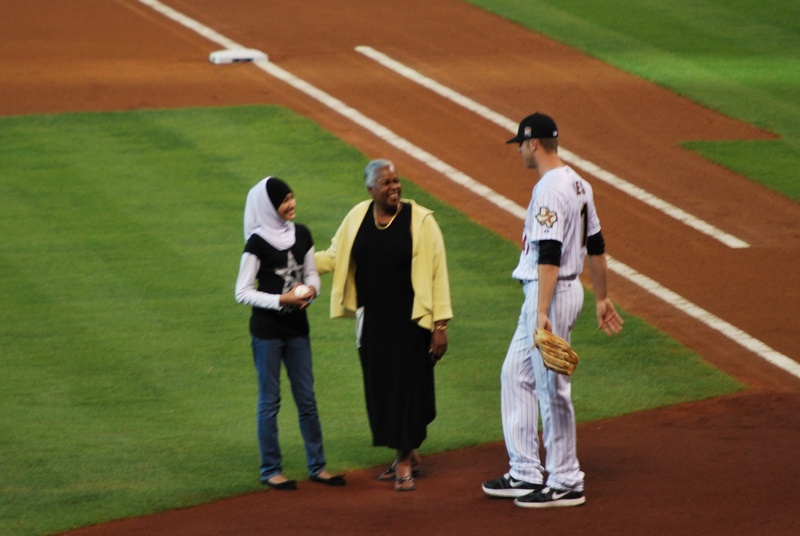 Sharon Robinson (Jackie’s daughter), escorted a fan to the mound for one of the ceremonial first pitches. I had just been to Citi Field the two days prior, where they honor Jackie with his own rotunda. It was cool to see his daughter the very next day. If you want to see my post about the rotunda, you can probably just scroll down to Monday’s post, or simply click here. Sharon Robinson is an educational consultant for Major League Baseball and oversees school and community-based educational programs. She’s done great things and reached millions of children (and adults) through her work, and I’m sure Major League Baseball is grateful to have her as a spokesperson. The game got underway, and the Astros took a 2-0 lead in the bottom of the second when they singled, doubled, and singled to open the frame. They scored three more in the third, and it wasn’t looking good for the Crew. Corey Hart cut the lead to four with a solo home run in the top of the fourth. The Astros came right back and scored two in the bottom half, to take a 7-1 lead. One of the Astro runs in the fourth came on a Carlos Lee home run to left field. 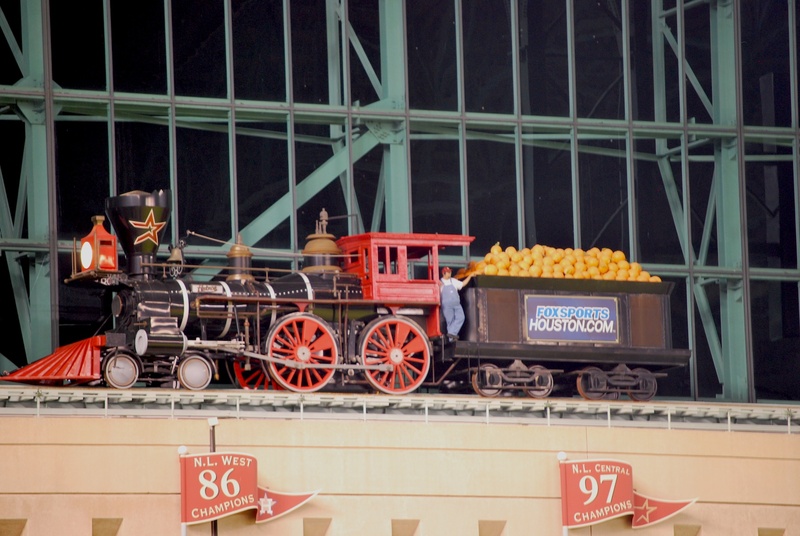 When an Astros player hits a home run, the train above the Crawford Boxes (slowly) moves right to left on a track built into on top of the wall. After the train stopped, the “conductor” got out and stood there for the remainder of the inning (you can see him in the picture below). They showed him on the scoreboard trying to get people excited as he pumped his fists and yelled, I’m not sure if it worked, but it was a good effort. You might ask: “Why a train?”, and I wouldn’t have had a good answer until I did some research. The largest entrance of the park is inside what was once Houston’s Union Station, and the train pays homage to the site’s history. I’ll have to search out the entrance today, because when you’re not really looking for it, or understand what it means, it probably isn’t the most apparent. The Astros put another run on the board in the seventh, the Brewers scored two in the ninth, and that was all the scoring. Final Score: Astros 8 – Brewers 3. Hopefully the Brewers can turn it around and start a winning streak, a long winning streak. Players underperforming has been a problem thus far, and I’m looking forward to some bounce back as we get deeper into the season. One last picture, it was visible in the four part picture, but it deserves a full one. 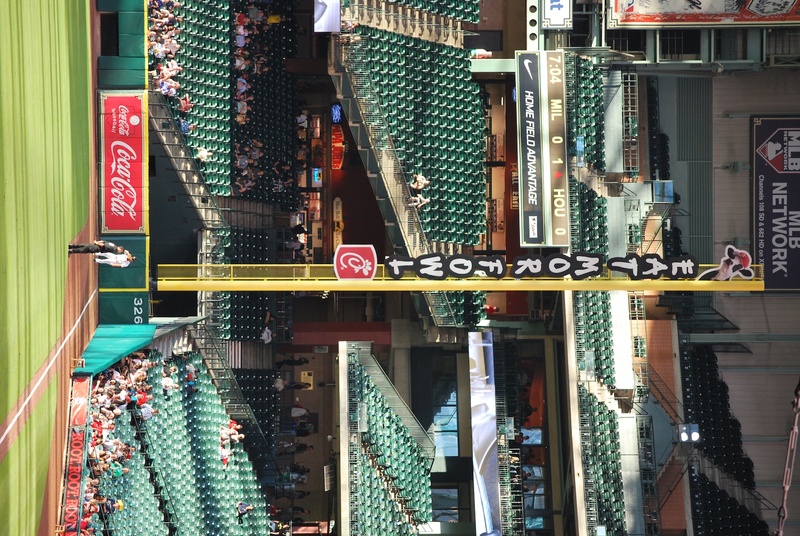 As you can see, the foul pole has “Eat Mor Fowl” on it, sponsored by Chick-Fil-A. The addition to the foul poles was unveiled before the 2006 season. All their commercials revolve around cows trying to get humans to eat more chicken, and less beef, so it’s very fitting. 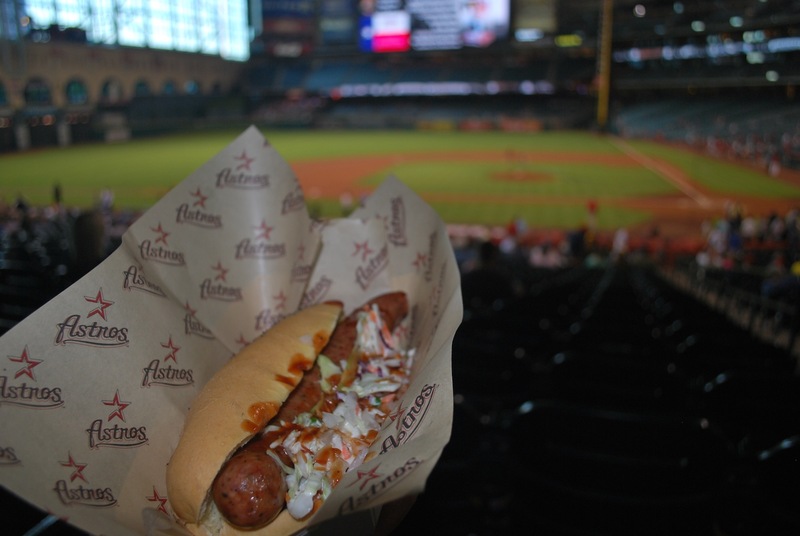 If an Astros player hits either “fowl” pole, everyone in attendance gets a free Chick-Fil-A chicken sandwich. Well played Chick-Fil-A, well played. It’s 12:30 pm now, and I’m heading out shortly. I’m going to walk around downtown Houston, take pictures, and just relax. Oh, and get to Jimmy John’s BEFORE 4:00.